Use the Lovepotion Collection on packaging, greeting cards, mugs, apparel, business cards, branding, typography and more! Lovepotion Sketched (OTF & TTF) – A hand-sketched, all caps typeface with loads of hand drawn charm. Lovepotion Script (OTF & TTF) – A sweet, smooth script font with decorative ends, standard ligatures and select alternates. Lovepotion Serif (OTF & TTF) – A charming, simple serif to compliment your script and sketched versions. 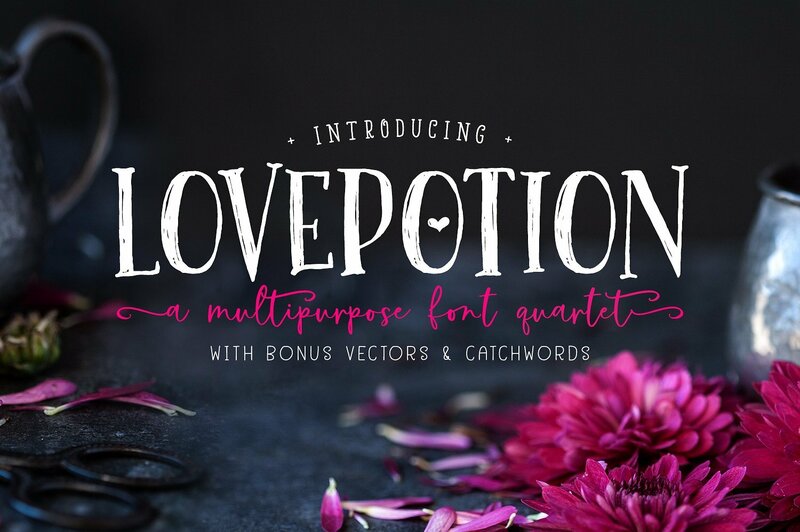 Lovepotion Elements (AI & EPS) – An adorable set of over 90 hand-illustrated elements to compliment your new font family. No special software is needed to install and use Blush & Bloom. I will say that a Glyphs Panel or Character map is helpful if you want to customize the font with specific ligatures and alternates, but it’s not necessary.